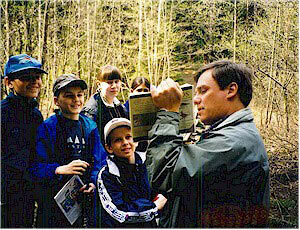 Association «Ecosystem» unite about 2,300 local organizations (Young naturalists and Young tourists Centers, schools and public environmental groups) including approximately 78,000 of teachers and students (10-16 years old) throughout the Russian Federation and former USSR states (see details). 1997-2006: cooperation with Montana State University, College of Education, Health and Human Development, Department of Education (Bozeman, Montana, USA) and Creek Farm Educational Associates — co-arranging the International Distance Courses for teachers “Ecological Field Techniques”. There are 3-4 graduate and postgraduate (in different semesters) seasonal courses, every year from 1999. Also in cooperation with Dr. Michael Brody from Montana State University we have elaborated Ecological Field Techniques Materials (in English) that include 40 ecological field study activities illustrated with videos of students and teachers conducting ecological research at "Ecosystem" Field Studies Centre. Each field study has a 5-9 minute video featuring real students conducting the ecological field techniques in nature. Each video illustrates the primary instructional outcomes and the major steps in accomplishing the task including reporting the results. Accompanying teacher materials (40 manuals) (7-20 pages of text for each lesson) include background ecological concepts, specific details about the field study techniques, approaches to analysis of the data collected and suggestions for conducting the field study with students. These materials are used in MSU distance courses.